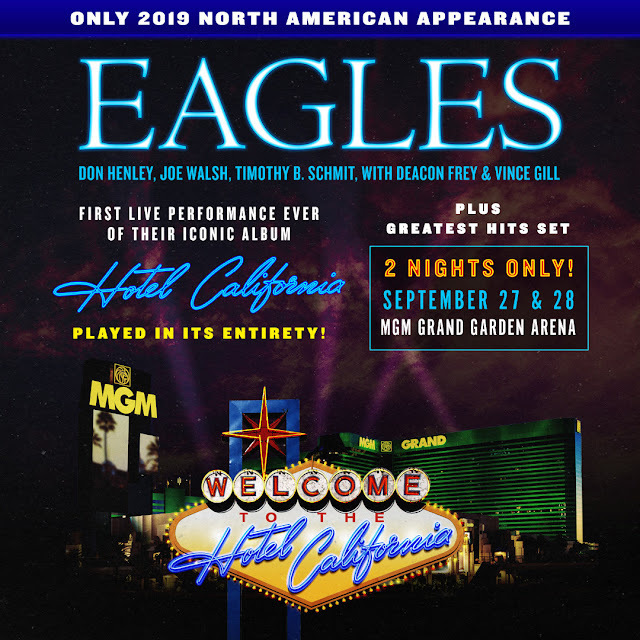 For the first time ever, the Eagles - Don Henley, Joe Walsh and Timothy B. Schmit, with Deacon Frey and Vince Gill - will perform their iconic album "Hotel California" in its entirety in their only North American performances of 2019. Each night's concert - Friday, September 27, 2019 and Saturday, September 28, 2019 at MGM Grand Garden Arena in Las Vegas, Nevada – will also include an additional set of the band's greatest hits. The shows are scheduled to begin at 8 PM. Tickets starting at $179 (not including applicable service charges or fees) go on sale to the general public on Friday, April 12 at 10 AM PDT through Ticketmaster.com. A limited number of LaneOne Premium Packages will also be available. Packages include amazing seats in first 3 rows, hotel accommodations, exclusive hospitality events, transportation, preferred entrance and more.